Today’s marketers are dealing with a shift in consumer behaviors in media consumption. Traditionally, marketers have been using top-of-mind awareness to reach customers. At its core, top-of-mind awareness relies on the ability to reach large numbers of potential consumers efficiently. Doing so used to be a relatively straightforward scheme. When Americans had just three major television networks, it was easy to reach large swaths of potential buyers with a single commercial. When overwhelming majorities of American households subscribed to the local newspaper and tuned into local radio stations, businesses with even very small trade areas could reach the majority of their prospective customers with a few, targeted media purchases. The fragmentation of the media landscape in the past twenty years is remarkable. In the era of just three main television networks, buying advertising time wasn’t a particularly difficult task. Now, one of the toughest jobs in the world — and most certainly one of the most difficult and thankless in marketing — is media buying, because there are countless ways to reach audiences. This is especially true in social, where new advertising opportunities (on Facebook and beyond) are being introduced seemingly every day. But we can’t use yesterday’s strategy with today’s new ad vehicles. Top-of-mind awareness requires companies to send messages consistently, but today’s consumers besieged with every company of every type, size, and description jostling for attention, making pleas to friend, follow, subscribe, read, watch, and click. Unimaginative marketers attempt to stand out with message frequency, or by exchanging bribes for attention (resulting in an explosion of Facebook contests and giveaways, among other tactics). So where do we, as marketers, go from here? I’d like to suggest that instead of using social media to blast your message at your customers, that you become a Youtility instead. A Youtility is being truly useful to your customer which will create a customer for life instead of a one-time sale. Not “utility,” because a utility is a faceless commodity. 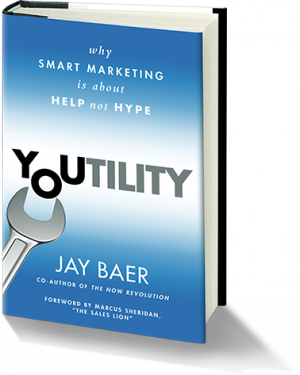 Youtility is marketing upside down. Instead of marketing that’s needed by companies, Youtility is marketing that’s wanted by customers. Youtility is massively useful information, provided for free, that creates long term trust and kinship between your company and your customers. The difference between helping and selling is just two letters. But those two letters now make all the difference. Making your company useful without expectation of an immediate return is in direct opposition to the longstanding principles of successful marketing, and that’s a good thing. How is your company dealing with the shift in consumer behavior and media consumption? 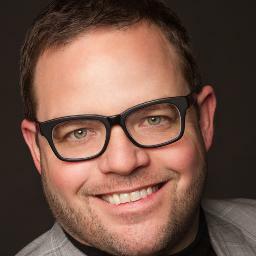 Jay Baer is a hype-free, tequila-loving social media strategist, speaker, and coach. He’s the author of Convince & Convert, one of the planet’s most popular social media blogs.